Day 5: July 15th / 10:45pm local time. Today was our fun day. 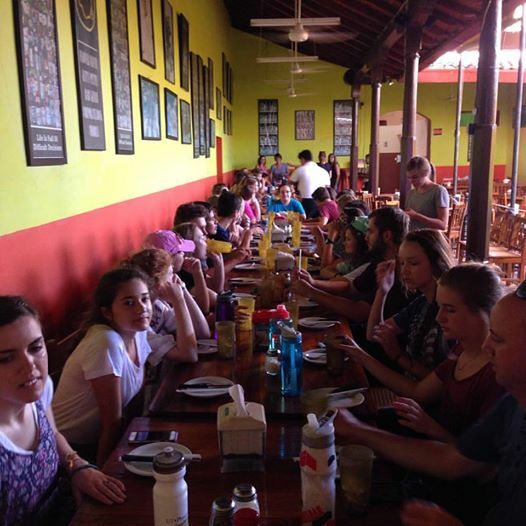 We toured an active volcano, went on a boat tour, ate some great pizza for lunch and visited the local market. All in all – a pretty cool day….but it was tonight that got me. Every night this week, all 61 of us gather outside in a little pavilion, sing a few worship songs, and “download” our experiences for the day. But tonight was different. Tonight I sat on a concrete floor and listened for over two hours as student after student got up and spoke. Tears flowed as I heard our young ladies hurt for the local women they served at House of Hope. Tears flowed as the young men spoke about the mantle of leadership they inspire to hold within their schools and at church. Tears flowed as adult leaders continually praised the students, many of them they have known since preschool. Tears flowed as student and adult spoke about how God had used them even in the mundane. You see this week many of our students have talked about what they wanted to do in the future. Tonight I wanted to remind them that it is important for us to remember that we don’t have to wait. For all of us, our feet are currently resting within the exact geographic circle of God’s calling on our lives. In the future God may call you outside that circle but it is where He has us for now. Our obedience to Him only matters in the present! There are many more stories to hear about this week. Find one of our students, sit down with them, and ask them to share. You’ll be inspired…..I was. This entry was posted in Leadership, Nicaragua, Sacrifice and tagged KSM Mission Trips.